OSA's Director of Strategic Initiatives, Elizabeth Reetz, and Archaeology Technician Specialist and Educator, Cherie Haury Artz, along with Jay Gorsh of University of Iowa Recreational Services, contributed a chapter to the newly edited volume by Berghahn Books, Public Engagement and Education: Developing and Fostering an Archaeological Future. 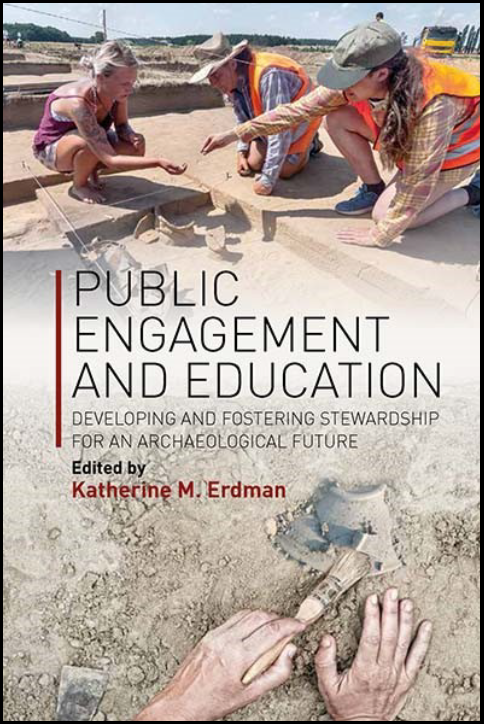 This book, edited by Katherine Erdman, shares effective approaches for engaging and education learners of all ages about archaeology and how one can encourage them to become stewards of the past. The book offers applied examples that are not bound to specific geographies or cultures, but rather are approaches that can be implemented almost anywhere. Chapter 3, Strengthening a Place-based Curriculum through the Integration of Archaeology and Environmental Education, explores the People and the Land unit (now called Archaeology) at the University of Iowa's School of the Wild as a case study for teaching archaeology through outdoor education. The practice of archaeology involves studying human adaptation to the natural world by using the environment as a vehicle for the development of knowledge. Archaeology education has strong parallels and intersections with the well-established field of Environmental Education (EE); yet, it is both widely acknowledged that cultural history is one of the weaker components of EE, and many archaeology educators are likewise unfamiliar with EE. In 2016, archaeologists partnered with staff from the University of Iowa School of the Wild, a week-long EE experience for area schools, to create a curricular unit that integrates archaeology and cultural history with EE. The pilot year yielded promising results for using EE as a tool to promote archaeological and environmental stewardship. This book is currently available in hardback or e-book format from Berghahn Books and Amazon. This listed price for the hardback is $130, but a 50% discount is available through April 30, 2019 using code ERD444 when purchasing directly from Berghan Books. Should you wish to ensure that your library include Public Engagement and Education in its collection, please find a link to the library recommendation form for your convenience here. 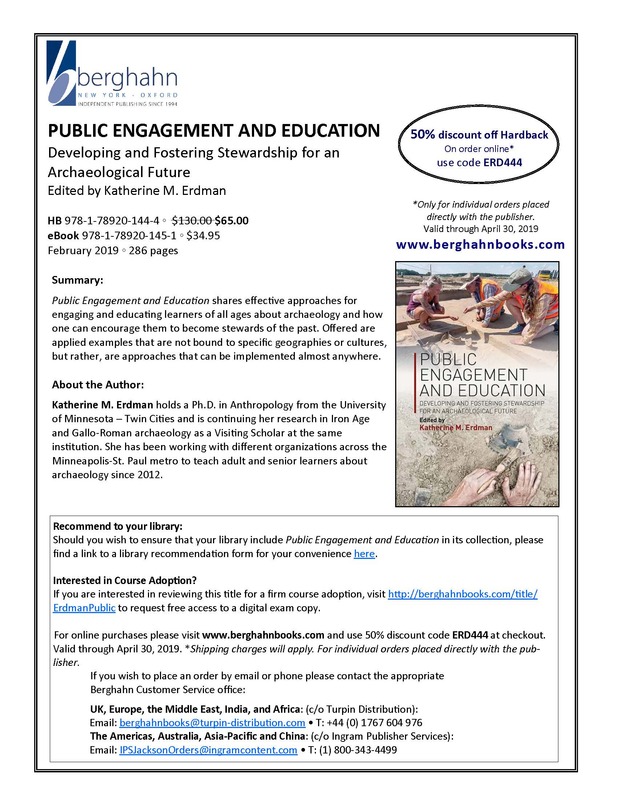 If you are interested in reviewing this title for course adoption, visit http://berghahnbooks.com/title/ErdmanPublic to request free access to a digital exam copy.